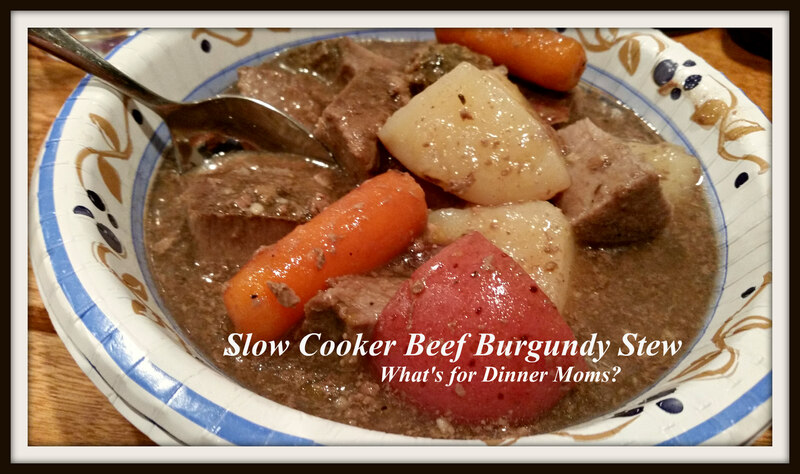 Slow Cooker Beef Burgundy Stew – What's for Dinner Moms? Reality is setting in. Vacation is over. A return to cleaning, cooking and chauffeuring yesterday made it all crystal clear. Of course I looked to my trusty slow cooker to help get dinner on the table with a minimum of fuss. As you can see in the picture above I even pulled out the finest of paper bowls to serve the stew. I am trying to ease into reality. I am doing what I can to get the kids off to school, get the house in order and keep everyone fed and clean in the easiest way. It gets harder and harder to get the system rolling again each time we take a break. But, dinner was simple and easy to clean up! That definitely helped. As the meal was cooking my daughter commented on how delicious it smelled. She normally does not like the smell of beer or wine but she commented on how good they smell when you cook with them. She decided that she will probably cook with them often when she is older but probably won’t drink them because they smell so bad otherwise. Can I hold her to this? The house did smell wonderful as dinner cooked. I had eye of round steaks to use. As you know these tend to be less fatty and a tough cut of meat. The slow cooker is a perfect way to tenderize them as they are cooked long and low. You can cut baby carrots into thirds for a more pleasing presentation but I was going for ease and just dumped the whole bag into the slow cooker. If you want your potatoes to stand up to cooking the whole time I suggest a heartier version than baby red potatoes. I put mine in about half way through the cooking time as they were small and I quartered them. If you can’t do that or want to just throw it together and let it cook all day use an all purposed potato like Yukon Gold. I served this with a green side salad and bread for soaking up all the sauce. Sprinkle meat with salt and pepper and place in the bottom of the slow cooker. Place carrots, onion, potatoes and potatoes. Stir in beef stock, wine and garlic. Cook on low 8-12 hours. Half an hour before serving skim any visible fat off the stew. Taste and adjust spices. Add salt, black pepper and powdered garlic as necessary. Make a slurry of 2 tablespoons of corn starch dissolved in 2 tablespoons of cold water. Stir mixture into the stew and turn it up to high heat. Allow to sit 10-15 minutes to thicken. If not thickened to desired consistency make a slurry with 1 teaspoon of corn starch dissolved in one teaspoon cold water and add to stew until desired consistency is reached. Variation: Instead of potatoes serve the stew over a hearty egg noodle or homemade noodles for a new twist. Next Post What’s for Dinner Moms? Do you not brown your meat beforehand? I like my beef very done, with no hit of blood (yuck). Doesn’t browning help with the taste? It does but on days when I am busy, like yesterday the meat fully cooks on the slow cooker. You can brown it before putting it in the slow cooker. We are a medium-rare family. Even my children who used to like it well done prefer medium-rare (pink to red center). It looks tasty, though. I usually use stew beef for my stew. What’s the difference between that and eye of round roast? Price and where it is cut from the cow. Eye of round is a cheaper, tougher cut of meat cut from the rear of the cow.. Little marbling of fat. Can be chewy and tough if not cooked properly. Stew beef tends to be from the front shoulder but can also be from the rear. Chuck is actually the “best” to use but when beef is $3.59 vs. $5.79 a pound I try to use the cheaper cuts in as many ways as possible. I have made a wonderful Eye of Round roast too that I have blogged about that cooks strangely but tastes amazing. The cost is expensive. The last time I purchased stew beef, it was close to $6.00 and the quality wasn’t that great. I’ll have to try this recipe next time I prepare beef stew. Eye of Round may not be for you if you like it well done. It will be a bit chewy. Eye of Round is best done like this https://whatsfordinnermoms.com/2015/01/14/eye-round-roast/ but I think that may be too rare for you. Yes, I am not a rare meat person. Thank you! I will be looking it up. There’s just nothing like the smell of a beef stew in the crock pot all day, yumm! Over noodles is a great idea. Thanks! Lol. We are at the oposite end. Fifteen degrees farenheit right now and dropping. Brrrr. Yummmmm!! I could go for a bowl of this right now! It’s freezing outside and we have nothing for dinner, lol. Oh, I’m down with the head cold bug and this sounds so tasty and warm! Yum! Of course I have only garlic and onions as far as ingredients…but I would mix it all up right now if I had the rest! Hope you feel better! Maybe time for chicken soup?